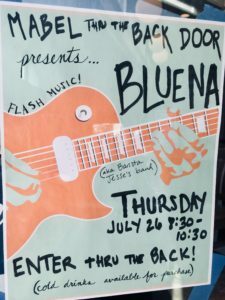 Introducing the first “Mabel through the back door” – a pop up live music event – our inaugural event features Bluena – led by our very own barista Jesse. Thursday July 26 – Time – 8:30 pm to 10:30. Enter through the back door. Suggested cover $5.